The collegiate regular season is slowly coming to an end. As teams continue to look toward the postseason, here’s a look at some current and former PGCBL players who helped their teams this week. Each week we will look at some of the specific standout performances in the form of a roundup. John Sansone (Amsterdam 2013) went 1-for-2 with two RBIs and a double for Florida State on Saturday in game two of a doubleheader. He also went 2-for-4 with three RBIs in game one of the doubleheader. Drew Carlton (Amsterdam 2015) earned his third win of the season Saturday for Florida State, tossing six innings, allowing just one run on four hits. Brian Brown (Amsterdam 2015) tossed six scoreless innings in a no-decision Saturday for NC State. Sal Ciccone (Watertown 2012) went 3-for-4 with two doubles Saturday in game two for Fairfield. He also went 2-for-4 in game one against Quinnipiac. Brendan Tracy (Amsterdam 2015) homered for Fairfield in game two on Saturday. Mike Wallace (Amsterdam 2015) picked up his second win of the season Saturday in game two for Fairfield. Danny Hrbek (Albany 2014) went 3-for-4 with an RBI Friday for Radford. 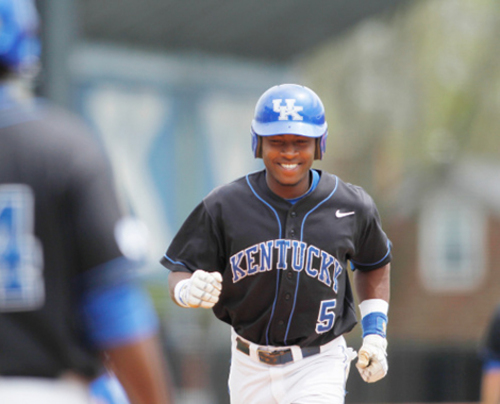 JaVon Shelby (Amsterdam 2014) went 2-for-4 with a home run on Saturday for Kentucky. He also went 2-for-3 with an RBI on Thursday. Zach Logue picked up his second win of the season for Kentucky on Saturday, tossing 2.2 scoreless innings. Logue also picked up his first save of the season on Friday. Dorian Hairston (Newark 2014) went 2-for-4 with a double for Kentucky on Thursday. Zack Brown (Amsterdam 2014) tossed 7.1 scoreless innings, striking out four in the process to earn his third win of the season on Thursday for Kentucky. Thomas Hackimer (Amsterdam 2014) notched his seventh save of the season on Saturday for St. John’s. His sixth save of the season came Tuesday. Rocky McCord (Amsterdam 2012) tossed 6.2 scoreless innings Saturday for Auburn to earn his third win of the season, striking out six in the process. Rich Vrana (Amsterdam 2013) tossed eight innings Sunday, earning his third win of the season. Tyler Kirkpatrick (Amsterdam 2015) went 3-for-4 with four RBIs and a home run on Saturday for Marist. Steve Laurino (Newark 2013) went 3-for-4 with five RBIs and a home run Wednesday for Marist. Tyler Phillips (Glens Falls 2015) went 2-for-4 with three RBIs and two doubles on Sunday for Herkimer CC. He also went 3-for-4 with a double on Friday. Pat Merryweather (Mohawk Valley 2015) tossed five scoreless innings, striking out five, in earning the win for Herkimber CC on Sunday. Chris Rave (Mohawk Valley 2015) went 2-for-3 with a home run and two RBIs for Herkimer CC on Saturday. He also went 3-for-3 with two doubles on Friday. Pat Dorrian (Saugerties 2015) went 3-for-3 with four RBIs, including a home run on Saturday for Herkimer CC. Marcus Failing (Mohawk Valley 2015) tossed five innings and struck out seven batters for Herkimer CC on Wednesday. Mark Williams (Adirondack 2014) picked up the win after firing six innings and allowing just two runs in the process for La Salle on Sunday. Luke Reilly (Adirondack 2015) tossed eight innings, allowing just one earned run and striking out six on Saturday for La Salle. Brent Cleland (Mohawk Valley 2015) picked up his second win of the season on Friday for Buffalo. Ryan Dorow (Adirondack 2015) went 2-for-4 with a home run for Adrian on Sunday. He also went 2-for-3 with a home run on Saturday. Kyle Ruchim (Glens Falls 2011) went 2-for-4 and homered for Northwestern on Saturday. Clint Hardy (Saugerties 2015) homered for Georgia Regents on Saturday. Luke Swenson (Newark 2011) went 4-for4 with three runs, an RBI and a double on Frday for UCSB. Zach Remillard (Albany 2013) went 2-for-3 with two RBIs and a double on Saturday for Coastal Carolina. He went 3-for4 with a home run on Friday. Zach Wall (Newark 2014) went 3-for-5 with four RBIs and a double on Saturday for Young Harris. Stephen Himic (Adirondack 2015) tossed five scoreless innings to pick up the win for Birmingham-Southern on Sunday. Matt Brown (Adirondack 2015) went 4-for-5 with two RBIs and a stolen base on Tuesday for Birmingham-Southern. Aaron Ashton (Adirondack 2015) went 3-for-5 with a home run and three RBIs on Friday for Lindsey Wilson. Will Miller (Albany 2014) went 2-for-5 with a home run and three RBIs on Sunday for Albany. Craig Lepre (Mohawk Valley 2013) went 3-for-5 with a home run and three RBIs on Saturday for Albany. Ryan Filipowicz (Watertown 2012) notched his first save of the season with 3.1 scoreless innings pitched Tuesday for Holy Cross. Conrad Ziemedorf (Newark 2014,2015) went 4-for-5 with three RBIs and a triple on Saturday for SUNY Cortland. He went 2-for-4 with a home run on Friday. Ziemendorf also went 2-for-2 with three RBIs, a home run and three walks on Tuesday. Austin Clock (Newark 2014,2015) went 2-for-4 with three RBIs on Friday for SUNY Cortland. Sean Greiser (Glens Falls 2015) tossed seven scoreless innings, allowing just two hits without walking a batter and striking out nine to earn his fifth win of the season on Saturday for Virginia Wesleyan. Jonathan Chudy (Cooperstown 2013) notched his first save of the season for Pace on Sunday, tossing two scoreless innings. Chris Kalousdian (Elmira 2013,2014) went 3-for-4 with a double on Sunday for Manhattan. Jack Fowler (Glens Falls 2014) tossed eight innings of one-run ball with 11 strikeouts to earn his second win of the season for Felician. Jake Jenkins (Watertown 2013) tossed 8.1 innings, allowing just two earned runs and picking up his second win of the season Friday for Pacific. Rollie Lacy (Adirondack 2014) tossed a complete game shutout on Friday for Creighton. The right-hander struck out eight and walked just one over the nine innings. Tommy Kain (Amsterdam 2014) homered for Lynn on Saturday. Anthony Herrera (Mohawk Valley 2015) got the game-winning hit in the bottom of the eighth and also earned the win Sunday for the University of Louisiana-Monroe. Jesse Whitmeyer (Adirondack 2014) tossed seven innings, allowed just one run, surrendered one walk and struck out 15 batters in his second win of the season for Mohawk Valley CC. Zach Breen (Amsterdam 2013,2014) picked up his fifth win of the season for Barton on Friday. Ryan Clark (Amsterdam 2014) tossed a nine-inning complete game shutout on Friday for UNC-Greensboro. Clark struck out 10 batters and walked just two. He allowed just two hits. TJ Dixon (Elmira 2014) went 2-for-4 with a walk, a double and a stolen base for Samford on Saturday. Parker Curry (Elmira 2013) tossed eight innings and picked up the win for Samford on Saturday. Jack Gerstenmaier (Newark 2014) made his college debut and went 3-for-4 on Wednesday for Virginia. He added two hits on Sunday. Cody Burton (Utica 2014) went 2-for-4 with three runs scored on Saturday for UAH. Logan Boyher (Newark 2014,2015) went 3-for-4 with four RBIs on Sunday for Columbia. Gus Craig (Mohawk Valley 2014) went 4-for-5 with two home runs and four RBIs Saturday for Columbia. He also tripled in the game. Charles Leblanc (Watertown 2014) went 2-for-4 with a home run and three RBIs Saturday for PITT. He also homered on Friday. Derek Reed (Newark 2014) went 5-for-6 with three RBIs and a double for the College of Saint Rose on Saturday. Zach Collett (Mohawk Valley 2014) went 2-for-5 with a triple and a home run on Tuesday for New Haven. There will not be a roundup next week.